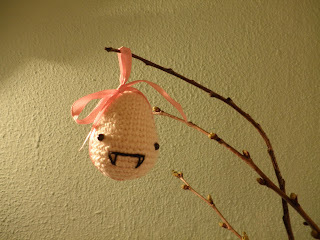 Vampire Easter egg crochet pattern!!!! FOR FREE! I just finished it, let me know what you think! Use any colour you like! Attach safety eyes, embroider mouth and fangs with black. 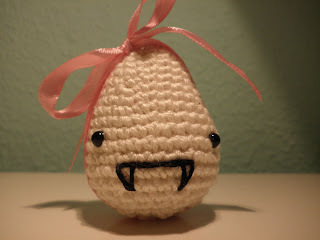 Sew ribbon to egg, make a little bow on top. I think it's absolutely darling! That is the cutest egg ever!! I am an editor for www.FaveCrafts.com and www.FaveCraftsBlog.com. We publish 1000’s of free craft projects and tips in every area of crafting at our website. We also publish a free crafting e-newsletter, Quick and Crafty, which has over 500,000 email subscribers. In addition to craft projects, we accept tips, techniques, and product tutorials. We are especially interested in craft videos, which we can embed on our website. You can easily submit Easter craft projects to us by email or send us the web link(s) to project(s) published online. You can send projects at any time to FaveCrafts. Though, for consideration for the Easter Blogger eBook, please submit projects by March 26, 2010. Your craft projects are sure to be seen by a wide audience of enthusiastic crafters. We are happy to link to your blog and share a great crafting source with our community. 2. Adding 12,000+ newsletter subscribers each week. 3. Over 1.5 Million Craft Projects Seen By Consumers Weekly. Thank you for your consideration. We hope to post your Easter craft projects at FaveCrafts soon! If you have any questions, please call or drop me an email at any time. Who knew vampires could be so cute! I'm with you, I can't stop making amigurumi. Maybe we've been bitten by a fangurumi! download the easter craft e-book for free! Now open, my dawanda shop!!! I am featured on favecrafts! I bought this cute printable on etsy! I am a guest writer on crochet spot!! Free stationery! Sweet little vampire! I am featured on crochetpatterncentral! Awesome people who follow this blog!